Are you bothered by eyeglasses or contact lenses? Imagine waking up and being able to see the clock without having to fumble for a pair of eyeglasses. You may know someone who has had Laser eye surgery and you have been thinking it over for some time now. Over 10 million cases of Laser eye surgery have been performed worldwide in the past 15 years. Laser eye surgery is a safe and effective procedure for those patients who want to have freedom from eyeglasses and/or contact lenses. The procedure has an extremely high success and accuracy rate for those patients that are good candidates. To ensure that you are a good candidate, consultations are available for patients to evaluate their candidacy and any questions or concerns can be discussed with Dr. Mah. 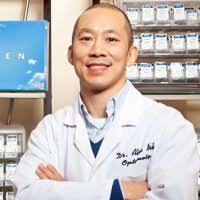 Dr. Mah had Laser eye surgery correction performed on himself in December 2002. We have managed hundreds of laser eye surgery cases, and have great experience in this exciting field. We are affiliated with the highest quality centers in Toronto as we have seen the results of many surgeons. We deal with only those with the absolute lowest complication rates. Laser surgery can be used to correct people with nearsightedness, farsightedness, astigmatism and even for people with bifocal prescriptions. In simple terms, Laser corrects the vision by changing the shape of the cornea (the front clear part of the eye). It can be thought of as placing your eyeglass prescription directly onto your eye permanently. The procedure begins with the creation of a hinged corneal flap. By applying the laser under a protective flap, it virtually eliminates potential scarring and minimizes pain and recovery time. After the eye is numbed with topical eye drops, a flap is created on the cornea to expose the underlying corneal tissue. This flap can be created with a microkeratome (a hand-held device) or with the IntraLase laser. This newer method allows a completely bladeless method to create the flap using a computer guided laser. The entire laser procedure takes less than 15 minutes for both eyes! The cornea is then reshaped using an extremely accurate excimer laser. 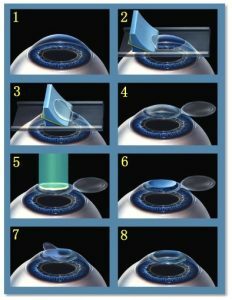 The way the cornea is reshaped is determined by a complex formula dictated by the Laser’s software and the Laser center’s programming of the software. Thus, each centre will have a slightly different “laser profile”. After the laser is applied, then the flap is replaced back to it’s original position. After Laser eye surgery, many patients experience immediate improved vision. In fact, most patients have driving vision within 24 hours of treatment. We have had many patients even achieve 20/20 vision the very next day after surgery! Patients can expect a very short Laser surgery recovery period and there is usually little to no discomfort during the procedure. We provide 6 follow exams after the procedure to monitor your vision and to ensure proper healing. Is Laser surgery the right choice for you? What makes a person a candidate for laser eye surgery is dependant on several factors such as corneal thickness, prescription, stability of prescription, any irregularities or scars on or near the front surface of the cornea, and overall eye health. Call us at 905 948-0050 to schedule a complementary laser surgery consultation to lean more about the procedure and to see if you are a suitable candidate.